Included Apps Only us$ 57.50 per month - for 10 users! Organize your sales process and coordinate the work of you sales team so they never "drop the ball" on a sales opportunity. Today more than ever, it is essential that you collect from your customers as quickly as possible. This application organizes your collection process to help you get your money ASAP. Build your own website or blog in a couple of clicks, link it with the largest social networks, get your word out and the customers in! Manage several projects easily, coordinating the work of your team with goals, milestones, tasks and sharing the information needed to succeed in your work. Make sure your customers always receive their product orders in a timely manner. Store and share your busines's important documents, linking them with your customer-data, projects, tasks or any other data type stored in Groobix. Store your busines's important dates and share them with your team: tax calendars, customer presentations, important visits and any other date that is important for your work. Now you can easily create, print and send your sales quotes, and track them all the way to maximize your sales opportunities. Use this application to ensure that all customer complaints and requests receive the best possible attention in the shortest time. 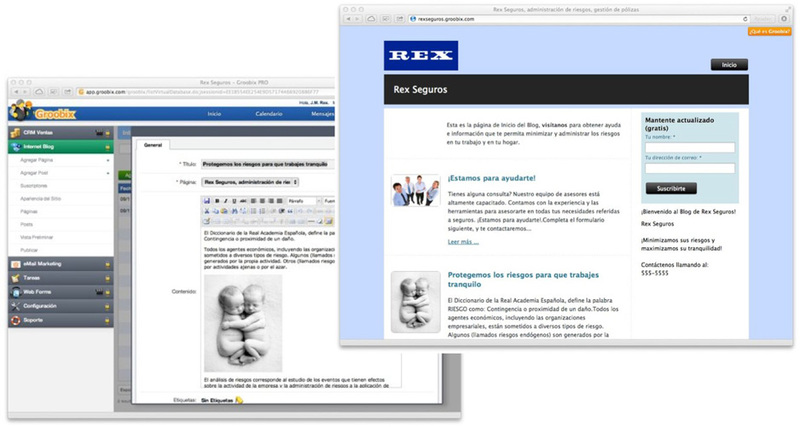 Now you can easily create forms for your website, e-mail, or share on social networks. And you do not need any programming or technical knowledge! 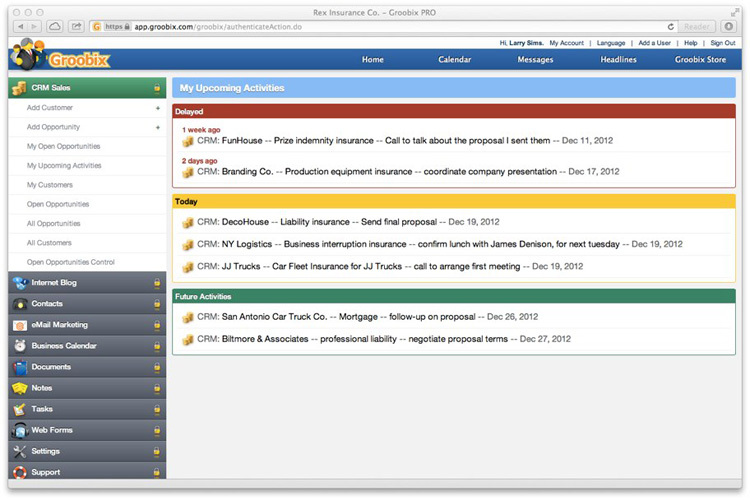 Your to-do list on steroids! and your team's too!. With this simple app you can make your workgroup unstoppable! Use this module to keep your checks portfolio under control, and be always aware of your upcoming finantial obligations. One of the major assets of your organization is its knowledge. Share it with Notes, easy to use and always available to everyone in your team. Create, print and send your invoices easily. 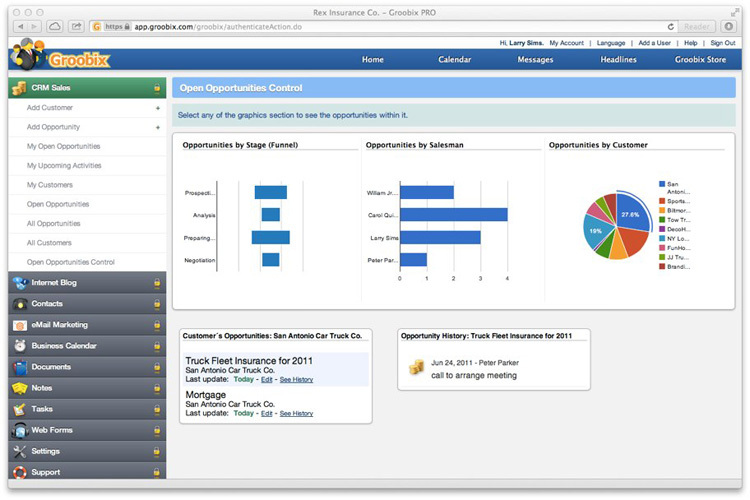 Plus, you get all the charts you need to understand and analyze your sales data. Use this application to easily monitor your inventory, using our flexible charting system to visualize your product availability. Create your subscriber list and keep them on the loop with all your news and promotions, in just a few minutes, with very little effort. 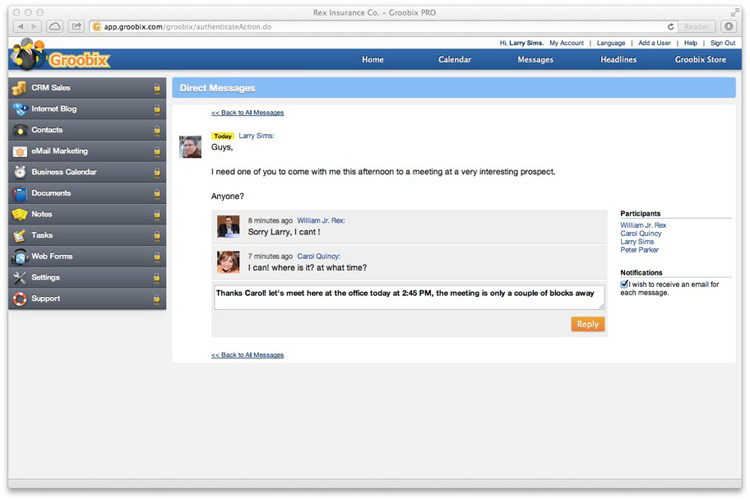 With our Direct Messages, internal communications in your work group have never been so fast and efficient. 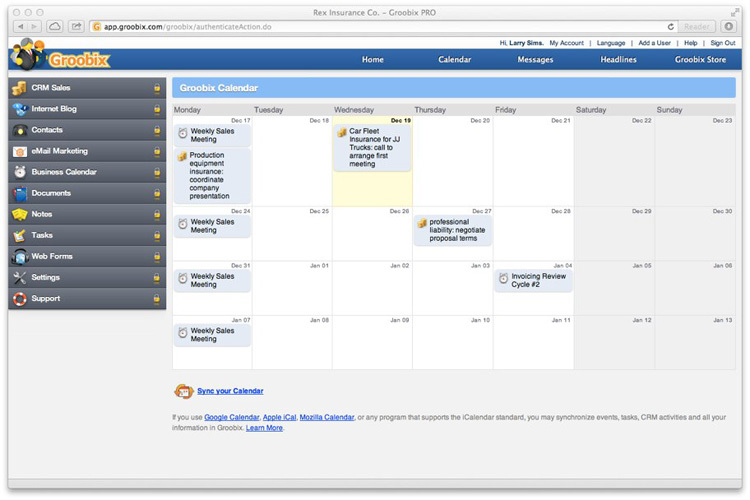 Do you need to keep track of the time you and your team spend on projects, tasks, or working for your customers? This app makes time tracking easy! A phone book like no other: always available, shared, and always backed-up. Never miss an important phone number again! and your most important business processes. 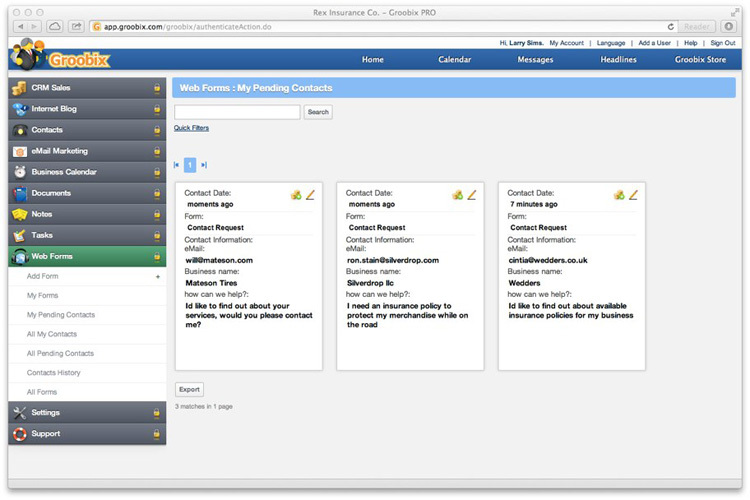 Groobix helps you avoid delays in your sales process and makes your salespeople keep the pace. Each day your team gets a guide with all the sales tasks to get done, and make all opportunities move forward. 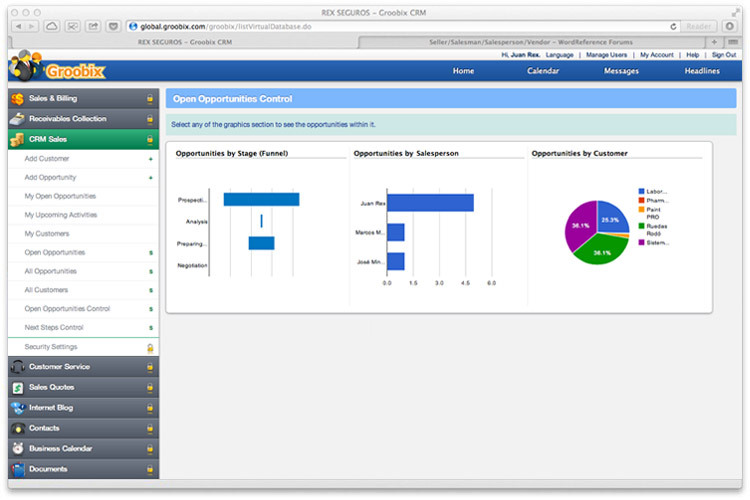 With clear, useful graphics, keep an eye on your sales and your team's work. Monitor your business progress from anywhere and make sure all opportunities advance as planed, or react rapidly to any change. Bring your customers to your own branded web-pages to present them with your Sales Quotes and Invoices. 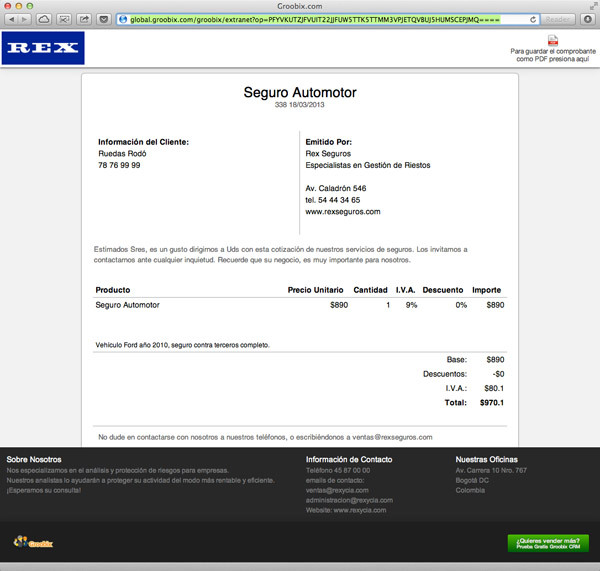 Your invoices and quotes are now also a great marketing tool! With Groobix it's extremely easy to make your business known and heard online, on the web and in social networks. Groobix apps implement the online marketing full circle: promotion -> lead capture -> lead management, with no technical knowledge required. Leverage the web to serve your customers at maximum speed. 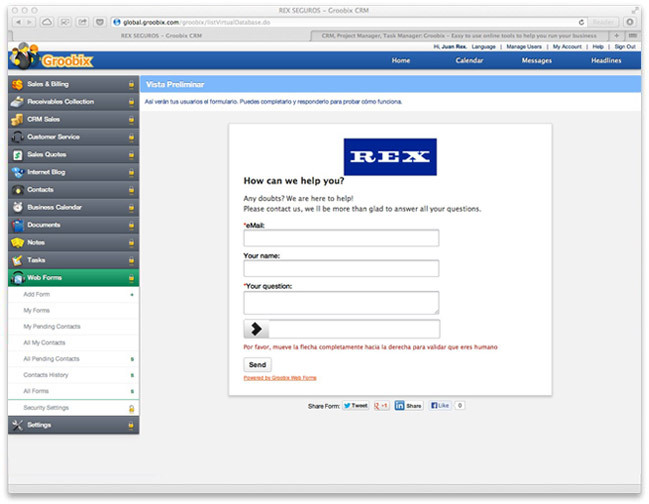 Create unlimited web forms. Groobix helps you receive your customers or prospects requests, and quickly identify and route new business opportunities to your sales team. Groobix includes applications specially crafted to improve your business' productivity. From internal discussiones, to project management and multi-user todo lists. 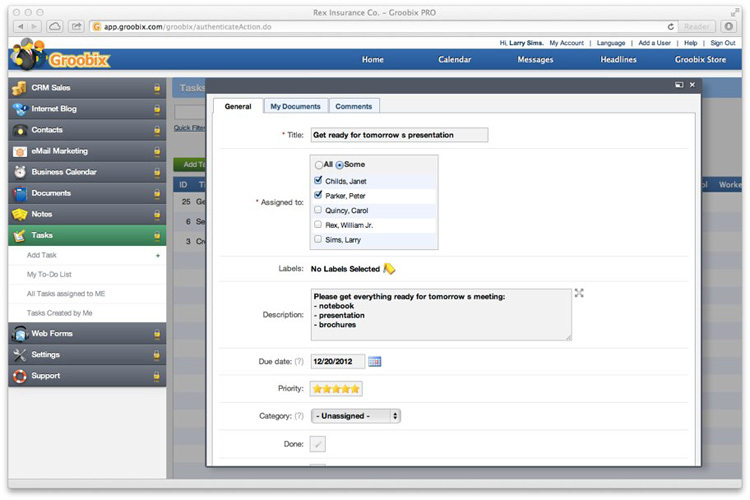 Share documents and useful information to coordinate your team and make it tick like a swiss clock.